Guided missile cruiser USS Lake Erie launching SM-3 ballistic missile interceptor, 2013. The U.S. Navy needs a new warship to replace its aging force of cruisers, and it wants to start buying them in five years. Larger than a destroyer but smaller than a battleship, the ship will be stacked with sensors, weapons, and unmanned vehicles. The Navy believes the new ship—which will probably cost more than $2 billion each—is needed to retain the ability to protect America’s aircraft carriers and allies from attack. In the 1980s, the U.S. Navy built 27 Ticonderoga-class guided missile cruisers. The Ticos were expressly designed to act as a floating bodyguard for aircraft carriers. The cruisers protect aircraft carriers from attack by detecting, tracking, and shooting down swarms of incoming anti-ship missiles launched by Soviet bombers. Armed with the AN/SPY-1 radar and scores of SM-2 surface to air missiles, the Ticonderogas were the most advanced anti-air weapons of their time. They could also, in a pinch, perform anti-submarine, anti-ship, and land attack missions. Today 22 of the missile cruisers are still in service, and their two five-inch guns and 122 Mk. 41 vertical launch missile silos make them formidable adversaries. The versatile Mk. 41 launcher accommodates a wide variety of rocket and missiles, including the SM-2 and SM-6 air defense missiles, SM-3 ballistic missile interceptors, Evolved SeaSparrow short range defense missiles, Tomahawk cruise missiles, ASROC anti-submarine rockets, and the new Long-Range Anti-Ship Missile. 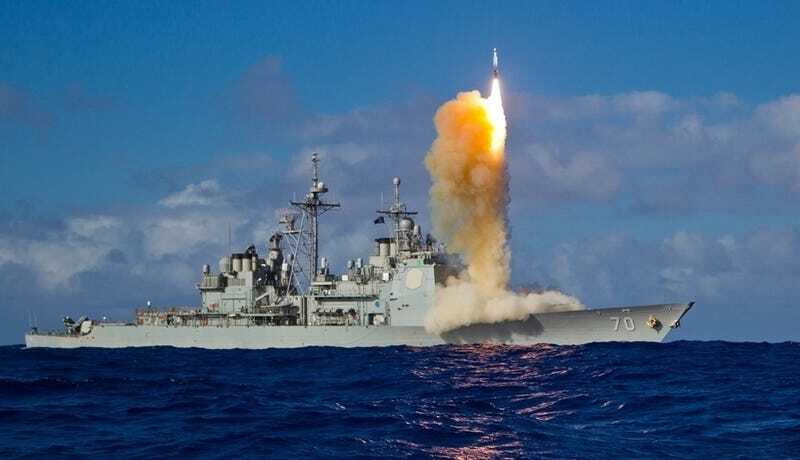 The Navy upgraded a handful of the ships to provide ballistic missile defense over both Asia and Europe, and 2008 one of them, USS Lake Erie, even downed a dying satellite in orbit. From subsea to space, the Ticonderogas can do it all. There’s one problem with the ships: they’re getting old. The oldest of the ships, Bunker Hill, was commissioned in 1986. The U.S. Navy tried to design and build replacements for the cruisers at least twice, and each time the effort has come to naught. Now, the Navy wants to replace them with a new class of ship, ordering the first in 2022 or 2023. According to DefenseNews the Navy’s Chief of Naval Operations Director of Surface Warfare has commissioned a “large surface combatant requirements evaluation team” to determine what the new class of ships will look like. What is known about the ships is they will carry the AN/SPY-6 Air and Missile Defense Radar, the same radar installed on new production Arleigh Burke-class destroyers, and the ship will built with an eye toward quick and easy hardware upgrades, keeping it on the cutting edge of technology throughout the lifetime of the ship. If we look at trends in military technology and the direction warfare is headed in, we can guess a little bit about what the rest of the ship will look like. The Navy says strictly speaking the new ship won’t be a cruiser but it will keep true to its cruiser roots, heavily weighted towards protecting carriers from aerial threats. Although the Soviet Navy and Air Force are gone, the Chinese military represents a new threat of growing size and sophistication. Modern carrier battle groups must contend with new weapons including the Chinese DF-21D anti-ship ballistic missile and Russian Kinzhal hypersonic air-launched ballistic missile. The future air defender will have to look higher and shoot farther than ever before. The new ship’s primary armament will be two or more fields of Mk. 41 missile silos with mix-and-match loadouts. The Mk.41 vertical launch system is perhaps the most versatile naval weapon system ever made. By adjusting the mix of missiles the Navy can easily adjust the ship’s mission, from air defender to ship killer. The Ticonderogas have 122 silos but the increase in missions, particularly missile defense, means the future ship will carry more. The Laser Weapon System (LaWS) deployed aboard the USS Ponce, 2014. Energy weapons are another possibility. In 2014, the Navy sent the Laser Weapon System (LaWS) to sea aboard the USS Ponce, the first operational deployment of a weapon laser. A more powerful shipboard laser could zap air and sea threats at short ranges, freeing up missile silos for longer range missiles. The Navy has also been testing railguns—guns that use electromagnetism to sling projectiles at speeds of up to Mach 6. Whether either type of weapon would be ready by 2023 is a good question. Sensors are arguably the most important part of the ship. The AN/SPY-6 radar will see more than a hundred miles in all directions, useful against incoming aircraft, anti-ship missiles skimming the surface of the water, and incoming ballistic missiles. Much of the new radar’s capabilities are classified but the developer, Raytheon, promises it can detect targets “half the size at twice the range” over existing radars. The battle fleet of the future will need all the advance warning it can get to counter mass attacks of supersonic and hypersonic missiles. Ship stealth, the ability to avoid detection by enemy radars on the high seas is now a permanent part of modern warfare. The first U.S. warships with reduced radar signatures were the Burke-class guided missile destroyers, but the new Zumwalt-class destroyers take stealth at sea to a whole new level. The problem with ship stealth is that it requires hiding all the pokey bits of a ship—the radar masts, gun barrels, antennas and other features under a big, slab-sided hull or superstructure. The Zumwalts, for example, encase radars and antennas in a single mast and retract the two 155-millimeter Advanced Gun System barrels underneath the deck. This gives stealthy ships an flat, angled look. It also makes them larger—the Zumwalts displace 15,000 tons, 5,000 tons more than the less stealthy Burkes. A ship that has fifty percent more firepower than the Zumwalts could run to 20,000 tons, making them the largest surface combatants built by the U.S. since World War II. A large flight deck and hangar capable of supporting helicopters and drones will be a must-have. The cruiser will likely have a pair of manned helicopters and several unmanned vertical takeoff drones. One possibility is the Navy adopts a large unmanned drone like the MUX being developed by the Marine Corps. Packed with radar or infrared sensors, drones could scout out hundreds of miles in front of the fleet. A MUX-like drone could also take on missions such as sinking small attack craft and providing fire support for the Marines. TERN vertical takeoff and landing drone. Finally, an integrated power system, or IPS will power the cruiser. Massive gas turbines, seagoing versions of those that power commercial jetliners, will provide megawatts of electrical power to the ship’s propulsion, sensors, and weapons. The first American ships with an IPS, the Zumwalts, can generate a staggering 78 megawatts—enough to power 58,000 American homes. Although it sounds excessive, this sort of capability is vital for powering energy-hungry lasers and railguns. This sounds great, but what kind of damage are we talking about to the federal budget? The current Arleigh Burke-class destroyers cost $1.7 billion each. The new Zumwalt class, on the other hand, cost $4 billion each. The Zumwalt class pioneered a lot of the work we might see in the new ship, particularly the new radar, unorthodox hull, and integrated power system, which should help reduce development costs. Ultimately it depends on how much capability the Navy wants to buy: while lasers and railguns will bump up the tab, it seems increasingly clear energy weapons are the future of naval warfare. Prepare for something north of $2.5 billion per ship. Whatever ship the Navy ends up designing, it will serve with the fleet for 50 years or more. Ships last longer and money is tighter, and the warship that provides the best service to the fleet will be the one that can change with the times. Thirty years ago, the idea of ballistic missiles hunting down aircraft carriers in the open ocean was science fiction. If the Navy is successful, the new warship will be able to deal with the unforeseen threats of 2058.